Abilene, Kansas — Many know it from old western movies as the end of the Chisholm Trail and the railhead for cattle drives from Texas. Others may know it as the home town of American general and president, Dwight D. Eisenhower. Few, however, other than those connected with the greyhound racing industry, are aware that Abilene is also the Greyhound Capital of America. Home of the National Greyhound Association , the racing greyhound registry and host of semi-annual national greyhound meets, Abilene has more greyhound farms than any other place in the country. 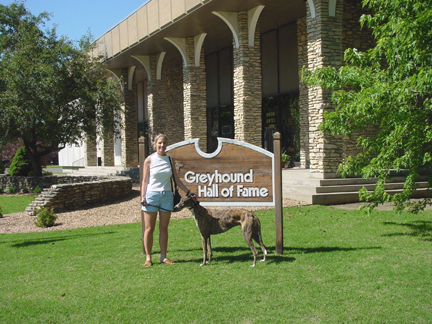 It also has the only museum in the world dedicated to the greyhound: the Greyhound Hall of Fame. Since opening its doors in 1973, this museum has introduced thousands of people to the dog world’s athlete and aristocrat. On a visit to the Greyhound Hall of Fame, we were delighted to see the prominent display in the lobby promoting greyhounds as pets. Employees are also quick to point out the benefits of having a retired racer as a pet and provide adoption referrals to anyone who may express an interest in obtaining one. Coins, statues, murals and other displays, help visitors to trace the breed’s development from its ancient beginnings as companions of monarchs up to the present day. Other exhibits include famous greyhounds and greyhound industry pioneers, a skeletal model of a greyhound, a training lure, and a scale model of a track. A theater shows a film about the greyhound racing industry. By far the most popular attraction, however is Derby, the Hall of Fame’s official greeter, who reigns over his little kingdom from a raised platform in the lobby area. The Hall of Fame also has a gift shop with a large and varied selection of greyhound paraphernalia that is also available by mail order though their impressive catalogue. Admission to the Greyhound Hall of Fame is free although donations are gladly accepted. It is located at 407 South Buckeye, across the street from the Eisenhower Museum, and is open daily from 9 a.m. to 5 p.m. except on New Year’s Day, Thanksgiving, and Christmas. Visitors should allow at least an hour to see the museum and visit with Derby. Since one of Derby’s predecessors died possibly as a result of an ailment picked up from a visiting dog, however, they are not enthusiastic about visitors bringing their greyhounds into the museum. For further information, you may contact the Hall of Fame at (785) 263-3000. For a brochure on other things to see and places to stay in Abilene, contact the Abilene Visitors Bureau at (800) 569-5915.